As an individual trying to be more creative on a personal level, and as a teacher interested in encouraging creativity in the classroom, I feel that I have a lot to learn from Jonah Lehrer‘s new book Imagine: How Creativity Works. 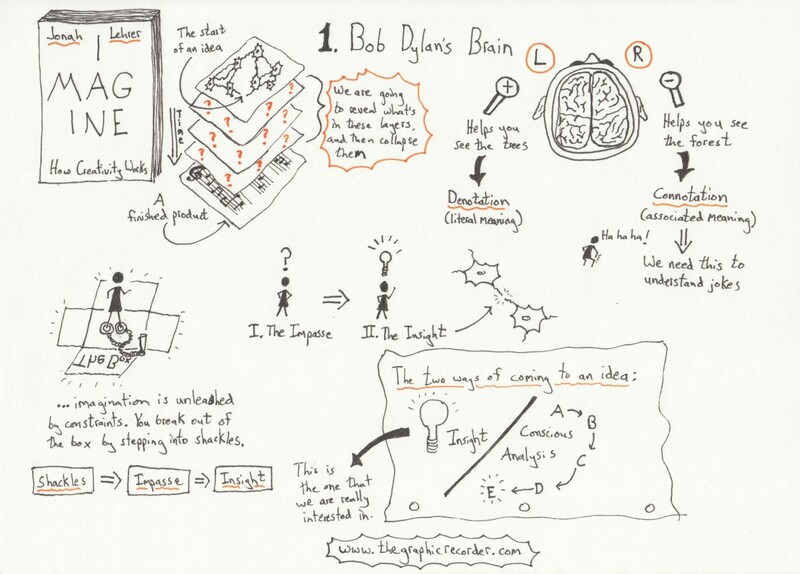 In the sketch notes above I have depicted what seem to me to be the key ideas from the book’s first chapter, titled Bob Dylan’s Brain. In this chapter Lehrer uses the story behind Bob Dylan’s groundbreaking single Like a Rolling Stone to highlight the process by which we arrive at an insightful idea. Insights are those ideas that come in a flash (often after being stuck at an impasse for some amount of time), as opposed to ideas reached by a more methodical approach – what Lehrer calls conscious analysis. Lehrer is particularly interested in what is going on inside the brain when moments of insight occur. The ultimate goal is understanding both how to foster those moments of insight and how to take an idea from a flash of insight and turn it into a fully-formed creative product. In the rest of this post I would like to start thinking about the implications of these ideas in an educational setting. As teachers we must ask ourselves: Is fostering creativity an explicit goal in our classroom? Do we provide the conditions that allow for insights to occur? Ask yourself this: After posing a question to the class, how long do you wait before calling on a student (if any hands are raised) or chiming in with a hint or even the full answer? That amount is the “wait time” that we give our students – the period of time we give for students to think if no answer comes right away. Our natural tendency is to fill that silence almost immediately if we see no hands shoot up in the air. Even waiting just five seconds can seem like an eternity. I have come to embrace those moments of silence that were once agonizing, because in those moments I imagine axons stretching out and neurons firing in the brain of every student that is searching for an answer. Allowing for that searching to occur is important because I believe that the satisfaction of arriving at an idea on your own trumps the satisfaction of merely being told the answer. In fact, it trumps it to such a degree that I think education should be more about providing opportunities for individual insight and less about delivering information for students to consume and then spit back out. But is five seconds of wait time enough? One important idea from this chapter is that the time it takes to move from impasse to insight is variable, and there is no reliable way to predict how long it will take. If we consider the moment of insight to be that moment when two neurons that were previously isolated suddenly connect, then we must realize that insight is entirely dependent upon the structure of the network that already exists within the student’s brain. This emphasizes the point that as teachers we must take care to consider each learner on an individual level, and not assume that every student will be able to “get” an idea within a teacher-defined amount of time. Some grading systems penalize students that don’t reach a certain level of understanding quick enough, even if they ultimately do reach it. Other systems try to break away from that tradition. Standards-based grading is one example of such a system, and it is worth looking into if you are not familiar with it. For one last connection between the content of this chapter and the educational setting, I would like to take Lehrer’s analogy of breaking out of the box by stepping into shackles and apply it to the student-teacher relationship. Here is one way of looking at that relationship: the teacher provides the shackles (the constraints under which the student will work) in such a way that will lead the student to an engaging impasse (an impasse that the student must want to overcome), and then provide mentoring so that the student sticks with it until that flash of insight arrives. If students were to experience flashes of insight on a regular basis, then school would be a much more enjoyable place – both for students and for teachers.